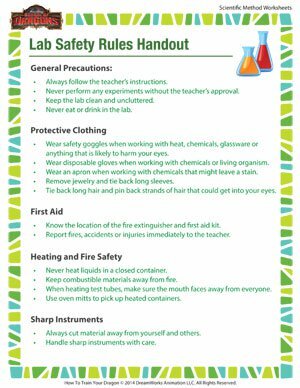 The importance of observing safety rules in the lab cannot be emphasized strongly enough. Get your students better acquainted with the rules regarding clothing, fire, first aid and other important topics by printing this free scientific method handout and putting it up in a prominent place. And then check out other fun scientific method worksheets at the School of Dragons.